Husband is Canadian so I let this slide. I typically like my sweet potatoes dressed savory rather than sweet. I eat mine just like a baked potato with butter, salt and pepper. But around the holidays, this dish always makes its way to the table as it is a favorite among friends and family. Arrange sweet potatoes on a baking sheet lined with aluminum foil then pierce each with a fork a few times to vent. Bake at 400 degrees until tender (usually about an hour for large sweet potatoes). Check tenderness by inserting a knife into the thickest potato – knife should slide in easily with no resistance. Do not boil the potatoes or use canned ones. I mean it! Allow sweet potatoes to cool to room temperature then remove the skins. Add sweet potatoes, sugar*, vanilla, salt, eggs and butter to a medium bowl or stand mixer. Mix on medium speed with an electric mixer for 2 minutes or until fluffy. 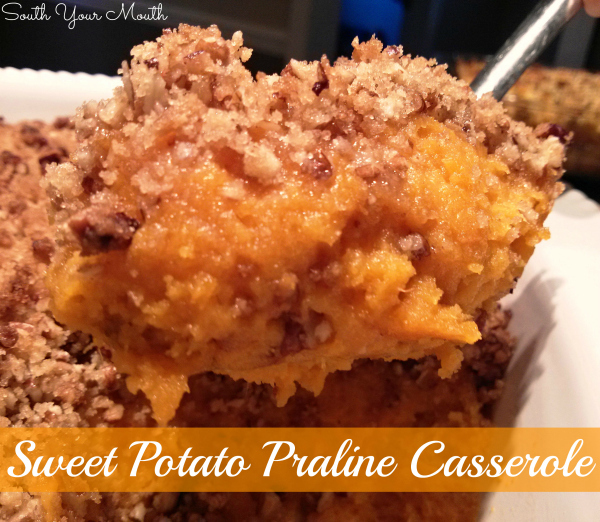 Spoon sweet potato mixture into a 9x9 casserole dish and spread evenly. *Start with 3/4 cup of sugar and add more if desired. Some sweet potatoes are much sweeter than others so the amount of sugar that you need can vary. Mix everything up to the eggs and taste it for sweetness. Make it as sweet as you like. To make praline topping, combine flour, brown sugar, pecans, butter and salt in a small bowl and mix until combined. Mixture will be crumbly. Sprinkle praline crumbles evenly over sweet potato mixture. Bake at 350 degrees for 30-35 minutes. I hope it lives up to your grandmother's recipe! Can't wait to try it. My husband & oldest son love it. Thanks for sharing your wonderful recipes. Thank you so much for emphasizing not to boil sweet potatoes ~ ever!!! Baking brings out the natural sugars ~ ahhh all that sweet sugarness! yum! Honestly, I don't care what time of year it is...I adore my sweet potatoes!! This sounds absolutely divine for anytime of the year!! Where I live, we do MANY Pot-Luck Dinner get-togethers, so dishes like this come in handy year-round!! I am always on the search for "something different", something "unique", something "nobody else will bring"!! Thank you for another "something" idea for me!! do u have anything that per tains to using dried cranberrie for the holidays i love them.. thanks mary w.
my name is mary w and its the only way i could get it to take my question so i just hit anonymous .. i only have an yahoo. e mail addy and so i couldnt use it cos it wasnt an option.. so thanks for pupshing my message .. thanks !!!! mary w.
I make this for my Honey. He loves it. However, I replace the sugar with bagged splenda to help cut the sugar amount down since he's borderline diabetic. I have been thinking seriously about pouring this in a pie shell and turning it into a pie. I think it's sweet enough to pass. Can Splenda (brown and white) be substituted for this recipe as I can't have any sugar? For the filling, yes. For the topping, no. 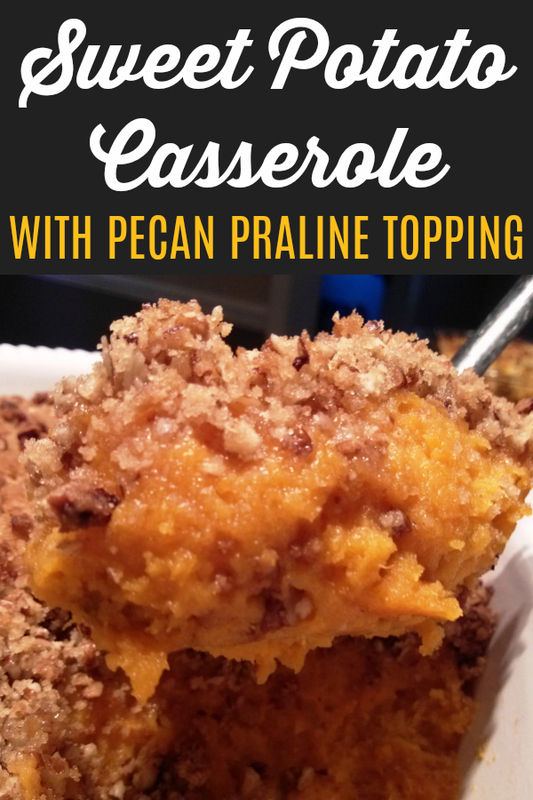 Sweet potato praline casserole will be on my table this year. I really enjoy your recipes and even had to beg forgiveness from the Lord because I had thrown away my bacon fat! Now I'm well stocked, thank you very much! Can you make this a day ahead and reheat it right before serving? Absolutely! I prep a lot of my casseroles the day before and then cook them while the turkey is resting. If you cook it all the way through the day before, cover with aluminum foil to reheat to prevent it from drying out or the pecans browning too much. Thanks Mandy! That's what we'll do. Looks delish - can't wait to eat it! And Happy Thanksgiving! 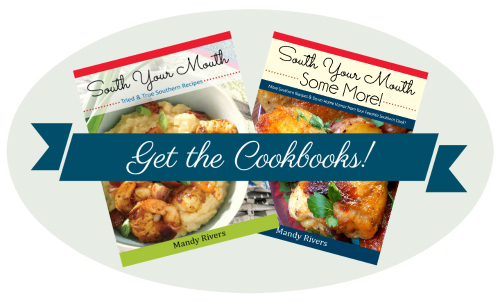 Thank you for this recipe Mandy! It was a HUGE hit with all of our guests yesterday and earned a permanent place on our Thanksgiving menu. Hope you had a wonderful and delicious day too! Probably 12-15 side dish servings. I agree with you about enjoying them savory. This recipe looks quite delicious and I will be giving it a go! Thanks for posting the recipe! I'm wanting to do this recipe for thanksgiving this year. I was wondering your thoughts if it would be good to add some sour cream or cream cheese to it to make it a little creamy, or would that ruin it? LOL If so, how much? I made this today for Thanksgiving Dinner and it was a huge hit with everyone. Yep, did this last year loved it. I just have one little problem. Lol my grown grandkids are allergic to nuts (bless their hearts) soo I put pecans on half of it. Did fine. I now have a gluten intolerant grandson in law GOOD Grief!! Why doesn't my topping come out crumbly. It is runny! Is your butter cold? Did you pack your brown sugar? Since I used margarine, it that why my topping came out runny?